If you are dealing with text in a computer, you need to know about encodings. Period. Yes, even if you are just sending emails. Even if you are just receiving emails. You don't need to understand every last detail, but you must at least know what this whole "encoding" thing is about. And the good news first: while the topic can get messy and confusing, the basic idea is really, really simple. This article is about encodings and character sets. An article by Joel Spolsky entitled The Absolute Minimum Every Software Developer Absolutely, Positively Must Know About Unicode and Character Sets (No Excuses!) is a nice introduction to the topic and I greatly enjoy reading it every once in a while. I hesitate to refer people to it who have trouble understanding encoding problems though since, while entertaining, it is pretty light on actual technical details. I hope this article can shed some more light on what exactly an encoding is and just why all your text screws up when you least need it. This article is aimed at developers (with a focus on PHP), but any computer user should be able to benefit from it. Everybody is aware of this at some level, but somehow this knowledge seems to suddenly disappear in a discussion about text, so let's get it out first: A computer cannot store "letters", "numbers", "pictures" or anything else. The only thing it can store and work with are bits. A bit can only have two values: yes or no, true or false, 1 or 0 or whatever else you want to call these two values. Since a computer works with electricity, an "actual" bit is a blip of electricity that either is or isn't there. For humans, this is usually represented using 1 and 0 and I'll stick with this convention throughout this article. In this encoding, 01100010 stands for the letter "b", 01101001 for the letter "i", 01110100 stands for "t" and 01110011 for "s". A certain sequence of bits stands for a letter and a letter stands for a certain sequence of bits. If you can keep this in your head for 26 letters or are really fast with looking stuff up in a table, you could read bits like a book. And there you have it, the way to represent human-readable text using only 1s and 0s. To encode something in ASCII, follow the table from right to left, substituting letters for bits. To decode a string of bits into human readable characters, follow the table from left to right, substituting bits for letters. To encode means to use something to represent something else. An encoding is the set of rules with which to convert something from one representation to another. The set of characters that can be encoded. "The ASCII encoding encompasses a character set of 128 characters." Essentially synonymous to "encoding". A "page" of codes that map a character to a number or bit sequence. A.k.a. "the table". Essentially synonymous to "encoding". A string is a bunch of items strung together. A bit string is a bunch of bits, like 01010011. A character string is a bunch of characters, like this. Synonymous to "sequence". There are many ways to write numbers. 10011111 in binary is 237 in octal is 159 in decimal is 9F in hexadecimal. They all represent the same value, but hexadecimal is shorter and easier to read than binary. I will stick with binary throughout this article to get the point across better and spare the reader one layer of abstraction. Do not be alarmed to see character codes referred to in other notations elsewhere, it's all the same thing. Now that we know what we're talking about, let's just say it: 95 characters really isn't a lot when it comes to languages. It covers the basics of English, but what about writing a risqué letter in French? A Straßen­übergangs­änderungs­gesetz in German? An invitation to a smörgåsbord in Swedish? Well, you couldn't. Not in ASCII. There's no specification on how to represent any of the letters é, ß, ü, ä, ö or å in ASCII, so you can't use them. "But look at it," the Europeans said, "in a common computer with 8 bits to the byte, ASCII is wasting an entire bit which is always set to 0! We can use that bit to squeeze a whole 'nother 128 values into that table!" And so they did. But even so, there are more than 128 ways to stroke, slice, slash and dot a vowel. Not all variations of letters and squiggles used in all European languages can be represented in the same table with a maximum of 256 values. So what the world ended up with is a wealth of encoding schemes, standards, de-facto standards and half-standards that all cover a different subset of characters. Somebody needed to write a document about Swedish in Czech, found that no encoding covered both languages and invented one. Or so I imagine it went countless times over. And not to forget about Russian, Hindi, Arabic, Hebrew, Korean and all the other languages currently in active use on this planet. Not to mention the ones not in use anymore. Once you have solved the problem of how to write mixed language documents in all of these languages, try yourself on Chinese. Or Japanese. Both contain tens of thousands of characters. You have 256 possible values to a byte consisting of 8 bit. Go! To create a table that maps characters to letters for a language that uses more than 256 characters, one byte simply isn't enough. Using two bytes (16 bits), it's possible to encode 65,536 distinct values. BIG-5 is such a double-byte encoding. Instead of breaking a string of bits into blocks of eight, it breaks it into blocks of 16 and has a big (I mean, BIG) table that specifies which character each combination of bits maps to. BIG-5 in its basic form covers mostly Traditional Chinese characters. GB18030 is another encoding which essentially does the same thing, but includes both Traditional and Simplified Chinese characters. And before you ask, yes, there are encodings which cover only Simplified Chinese. Can't just have one encoding now, can we? GB18030 covers quite a range of characters (including a large part of latin characters), but in the end is yet another specialized encoding format among many. Finally somebody had enough of the mess and set out to forge a ring to bind them all create one encoding standard to unify all encoding standards. This standard is Unicode. It basically defines a ginormous table of 1,114,112 code points that can be used for all sorts of letters and symbols. That's plenty to encode all European, Middle-Eastern, Far-Eastern, Southern, Northern, Western, pre-historian and future characters mankind knows about.2 Using Unicode, you can write a document containing virtually any language using any character you can type into a computer. This was either impossible or very very hard to get right before Unicode came along. There's even an unofficial section for Klingon in Unicode. Indeed, Unicode is big enough to allow for unofficial, private-use areas. So, how many bits does Unicode use to encode all these characters? None. Because Unicode is not an encoding. Confused? Many people seem to be. Unicode first and foremost defines a table of code points for characters. That's a fancy way of saying "65 stands for A, 66 stands for B and 9,731 stands for ☃" (seriously, it does). How these code points are actually encoded into bits is a different topic. To represent 1,114,112 different values, two bytes aren't enough. Three bytes are, but three bytes are often awkward to work with, so four bytes would be the comfortable minimum. But, unless you're actually using Chinese or some of the other characters with big numbers that take a lot of bits to encode, you're never going to use a huge chunk of those four bytes. If the letter "A" was always encoded to 00000000 00000000 00000000 01000001, "B" always to 00000000 00000000 00000000 01000010 and so on, any document would bloat to four times the necessary size. To optimize this, there are several ways to encode Unicode code points into bits. UTF-32 is such an encoding that encodes all Unicode code points using 32 bits. That is, four bytes per character. It's very simple, but often wastes a lot of space. UTF-16 and UTF-8 are variable-length encodings. If a character can be represented using a single byte (because its code point is a very small number), UTF-8 will encode it with a single byte. If it requires two bytes, it will use two bytes and so on. It has elaborate ways to use the highest bits in a byte to signal how many bytes a character consists of. This can save space, but may also waste space if these signal bits need to be used often. UTF-16 is in the middle, using at least two bytes, growing to up to four bytes as necessary. Characters are referred to by their "Unicode code point". Unicode code points are written in hexadecimal (to keep the numbers shorter), preceded by a "U+" (that's just what they do, it has no other meaning than "this is a Unicode code point"). The character Ḁ has the Unicode code point U+1E00. In other (decimal) words, it is the 7680th character of the Unicode table. It is officially called "LATIN CAPITAL LETTER A WITH RING BELOW". A summary of all the above: Any character can be encoded in many different bit sequences and any particular bit sequence can represent many different characters, depending on which encoding is used to read or write them. The reason is simply because different encodings use different numbers of bits per characters and different values to represent different characters. Why in god's name are my characters garbled?! If you open a document and it looks like this, there's one and only one reason for it: Your text editor, browser, word processor or whatever else that's trying to read the document is assuming the wrong encoding. That's all. The document is not broken (well, unless it is, see below), there's no magic you need to perform, you simply need to select the right encoding to display the document. Well, let's try to interpret this as ASCII. Hmm, most of these bytes start3 with a 1 bit. If you remember correctly, ASCII doesn't use that bit. So it's not ASCII. What about UTF-8? Hmm, no, most of these sequences are not valid UTF-8.4 So UTF-8 is out, too. Let's try "Mac Roman" (yet another encoding scheme for them Europeans). Hey, all those bytes are valid in Mac Roman. 10000011 maps to "É", 01000111 to "G" and so on. If you read this bit sequence using the Mac Roman encoding, the result is "ÉGÉìÉRÅ[ÉfÉBÉìÉOÇÕìÔÇµÇ≠Ç»Ç¢". That looks like a valid string, no? Yes? Maybe? Well, how's the computer to know? Maybe somebody meant to write "ÉGÉìÉRÅ[ÉfÉBÉìÉOÇÕìÔÇµÇ≠Ç»Ç¢". For all I know that could be a DNA sequence.5 Unless you have a better suggestion, let's declare this to be a DNA sequence, say this document was encoded in Mac Roman and call it a day. Of course, that unfortunately is complete nonsense. The correct answer is that this text is encoded in the Japanese Shift-JIS encoding and was supposed to read "エンコーディングは難しくない". Well, who'd've thunk? The primary cause of garbled text is: Somebody is trying to read a byte sequence using the wrong encoding. The computer always needs to be told what encoding some text is in. Otherwise it can't know. There are different ways how different kinds of documents can specify what encoding they're in and these ways should be used. A raw bit sequence is always a mystery box and could mean anything. Most browsers allow the selection of a different encoding in the View menu under the menu option "Text Encoding", which causes the browser to reinterpret the current page using the selected encoding. Other programs may offer something like "Reopen using encoding…" in the File menu, or possibly an "Import…" option which allows the user to manually select an encoding. My document doesn't make sense in any encoding! This is now the UTF-8 bit sequence representing the text "ÉGÉìÉRÅ[ÉfÉBÉìÉOÇÕìÔÇµÇ≠Ç»Ç¢". This bit sequence has absolutely nothing to do with our original document. Whatever encoding we try to open it in, we won't ever get the text "エンコーディングは難しくない" from it. It is completely lost. It would be possible to recover the original text from it if we knew that a Shift-JIS document was misinterpreted as Mac Roman and then accidentally saved as UTF-8 and reversed this chain of missteps. But that would be a lucky fluke. Many times certain bit sequences are invalid in a particular encoding. If we tried to open the original document using ASCII, some bytes would be valid in ASCII and map to a real character and others wouldn't. The program you're opening it with may decide to silently discard any bytes that aren't valid in the chosen encoding, or possibly replace them with ?. There's also the "Unicode replacement character" � (U+FFFD) which a program may decide to insert for any character it couldn't decode correctly when trying to handle Unicode. If a document is saved with some characters gone or replaced, then those characters are really gone for good with no way to reverse-engineer them. If a document has been misinterpreted and converted to a different encoding, it's broken. Trying to "repair" it may or may not be successful, usually it isn't. Any manual bit-shifting or other encoding voodoo is mostly that, voodoo. It's trying to fix the symptoms after the patient has already died. So how to handle encodings correctly? It's really simple: Know what encoding a certain piece of text, that is, a certain byte sequence, is in, then interpret it with that encoding. That's all you need to do. If you're writing an app that allows the user to input some text, specify what encoding you accept from the user. For any sort of text field, the programmer can usually decide its encoding. For any sort of file a user may upload or import into a program, there needs to be a specification what encoding that file should be in. Alternatively, the user needs some way to tell the program what encoding the file is in. This information may be part of the file format itself, or it may be a selection the user has make (not that most users would usually know, unless they have read this article). If you need to convert from one encoding to another, do so cleanly using tools that are specialized for that. Converting between encodings is the tedious task of comparing two code pages and deciding that character 152 in encoding A is the same as character 4122 in encoding B, then changing the bits accordingly. This particular wheel does not need reinventing and any mainstream programming language includes some way of converting text from one encoding to another without needing to think about code points, pages or bits at all. That's all there is to it. The content of the string, that is, the human readable characters, didn't change, but it's now a valid UTF-32 string. If you keep treating it as UTF-32, there's no problem with garbled characters. As discussed at the very beginning though, not all encoding schemes can represent all characters. It's not possible to encode the character "縧" in any encoding scheme designed for European languages. Something Bad™ would happen if you tried to. Precisely because of that, there's virtually no excuse in this day and age not to be using Unicode all the way. Some specialized encodings may be more efficient than the Unicode encodings for certain languages. But unless you're storing terabytes and terabytes of very specialized text (and that's a lot of text), there's usually no reason to worry about it. Problems stemming from incompatible encoding schemes are much worse than a wasted gigabyte or two these days. And this will become even truer as storage and bandwidth keeps growing larger and cheaper. If your system needs to work with other encodings, convert them to Unicode upon input and convert them back to other encodings on output as necessary. Otherwise, be very aware of what encodings you're dealing with at which point and convert as necessary, if that's possible without losing any information. There are situations where encodings are handled incorrectly but things still work. An often-encountered situation is a database that's set to latin-1 and an app that works with UTF-8 (or any other encoding). Pretty much any combination of 1s and 0s is valid in the single-byte latin-1 encoding scheme. If the database receives text from an application that looks like 11100111 10111000 10100111, it'll happily store it, thinking the app meant to store the three latin characters "ç¸§". After all, why not? It then later returns this bit sequence back to the app, which will happily accept it as the UTF-8 sequence for "縧", which it originally stored. The database admin interface automatically figures out that the database is set to latin-1 though and interprets any text as latin-1, so all values look garbled only in the admin interface. To the parser, anything following a quotation mark is just a byte sequence which it will take as-is until it encounters another quotation mark. If you simply output this byte sequence, you're outputting UTF-8 text. No need to do anything else. The parser does not need to specifically support UTF-8, it just needs to take strings literally. Naive parsers can support Unicode this way without actually supporting Unicode. Many modern languages are explicitly Unicode-aware though. This last section deals with issues surrounding Unicode and PHP. Some portions of it are applicable to programming languages in general while others are PHP specific. Nothing new will be revealed about encodings, but concepts described above will be rehashed in the light of practical application. PHP doesn't natively support Unicode. Except it actually supports it quite well. The previous section shows how UTF-8 characters can be embedded in any program directly without problems, since UTF-8 is backwards compatible with ASCII, which is all PHP needs. The statement "PHP doesn't natively support Unicode" is true though and it seems to cause a lot of confusion in the PHP community. To clarify that second point: All text is already encoded in some encoding. When you type it into the source code, it has some encoding. Specifically, whatever you saved it as in your text editor. If you get it from a database, it's already in some encoding. If you read it from a file, it's already in some encoding. Text is either encoded in UTF-8 or it's not. If it's not, it's encoded in ASCII, ISO-8859-1, UTF-16 or some other encoding. If it's not encoded in UTF-8 but is supposed to contain "UTF-8 characters",7 then you have a case of cognitive dissonance. If it does contain actual characters encoded in UTF-8, then it's actually UTF-8 encoded. 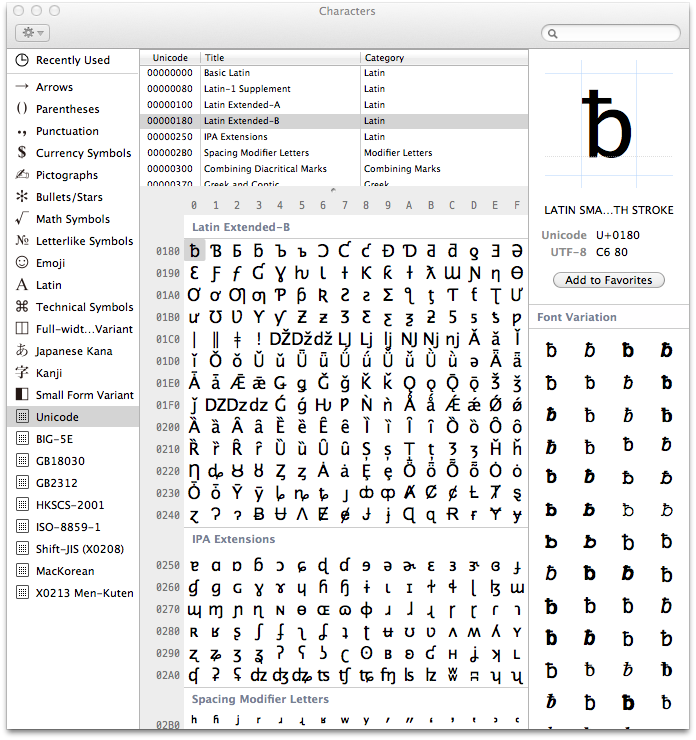 Text can't contain Unicode characters without being encoded in one of the Unicode encodings. So what in the world does utf8_encode do then? Aha! So what the author actually wanted to say is that it converts the encoding of text from ISO-8859-1 to UTF-8. That's all there is to it. utf8_encode must have been named by some European without any foresight and is a horrible, horrible misnomer. The same goes for utf8_decode. These functions are useless for any purpose other than converting between ISO-8859-1 and UTF-8. If you need to convert a string from any other encoding to any other encoding, look no further than iconv. utf8_encode is not a magic wand that needs to be swung over any and all text because "PHP doesn't support Unicode". Rather, it seems to cause more encoding problems than it solves thanks to terrible naming and unknowing developers. If that $string was in a single-byte encoding, this would give us the first character. But only because "character" coincides with "byte" in a single-byte encoding. PHP simply gives us the first byte without thinking about "characters". Strings are byte sequences to PHP, nothing more, nothing less. All this "readable character" stuff is a human thing and PHP doesn't care about it. c        a        r        e        ! The same goes for many standard functions such as substr, strpos, trim and so on. The non-support arises if there's a discrepancy between the length of a byte and a character. Using $string on the above string will, again, give us the first byte, which is 11100110. In other words, a third of the three-byte character "漢". 11100110 is, by itself, an invalid UTF-8 sequence, so the string is now broken. If you felt like it, you could try to interpret that in some other encoding where 11100110 represents a valid character, which will result in some random character. Have fun, but don't use it in production. And that's actually all there is to it. "PHP doesn't natively support Unicode" simply means that most PHP functions assume one byte = one character, which may lead to it chopping multi-byte characters in half or calculating the length of strings incorrectly if you're naively using non-multi-byte-aware functions on multi-byte strings. It does not mean that you can't use Unicode in PHP or that every Unicode string needs to be blessed by utf8_encode or other such nonsense. Luckily, there's the Multibyte String extension, which replicates all important string functions in a multi-byte aware fashion. Using mb_substr($string, 0, 1, 'UTF-8') on the above string correctly returns 11100110 10111100 10100010, which is the whole "漢" character. Because the mb_ functions now have to actually think about what they're doing, they need to know what encoding they're working on. Therefore every mb_ function accepts an $encoding parameter as well. Alternatively, this can be set globally for all mb_ functions using mb_internal_encoding. You can't save PHP source code in an ASCII-incompatible encoding. For example, in UTF-16 a " is encoded as 00000000 00100010. To PHP, which tries to read everything as ASCII, that's a NUL byte followed by a ". PHP will probably get a hiccup if every other character it finds is a NUL byte. You can save PHP source code in any ASCII-compatible encoding. If the first 128 code points of an encoding are identical to ASCII, PHP can parse it. All characters that are in any way significant to PHP are within the 128 code points defined by ASCII. If string literals contain any code points beyond that, PHP doesn't care. You can save PHP source code in ISO-8859-1, Mac Roman, UTF-8 or any other ASCII-compatible encoding. The string literals in your script will have whatever encoding you saved your source code as. Any external file you process with PHP can be in whatever encoding you like. If PHP doesn't need to parse it, there are no requirements to meet to keep the PHP parser happy. The above will simply read the bits in bar.txt into the variable $foo. PHP doesn't try to interpret, convert, encode or otherwise fiddle with the contents. The file can even contain binary data such as an image, PHP doesn't care. Both "Foobar" strings need to have an identical bit representation if you want to find the correct localization. If the source code was saved in ASCII but the localization file in UTF-16, the strings wouldn't match. Either some sort of encoding conversion would be necessary or the use of an encoding-aware string matching function. The astute reader might ask at this point whether it's possible to save a, say, UTF-16 byte sequence inside a string literal of an ASCII encoded source code file, to which the answer would be: absolutely. e        c        h        o                 "
The first line and the last two bytes are ASCII. The rest is UTF-16 with two bytes per character. The leading 11111110 11111111 on line 2 is a marker required at the start of UTF-16 encoded text (required by the UTF-16 standard, PHP doesn't give a damn). This PHP script will happily output the string "UTF-16" encoded in UTF-16, because it simple outputs the bytes between the two double quotes, which happens to represent the text "UTF-16" encoded in UTF-16. The source code file is neither completely valid ASCII nor UTF-16 though, so working with it in a text editor won't be much fun. PHP supports Unicode, or in fact any encoding, just fine, as long as certain requirements are met to keep the parser happy and the programmer knows what he's doing. You really only need to be careful when manipulating strings, which includes slicing, trimming, counting and other operations that need to happen on a character level rather than a byte level. If you're not "doing anything" with your strings besides reading and outputting them, you will hardly have any problems with PHP's support of encodings that you wouldn't have in any other language as well. Other languages are simply encoding-aware. Internally they store strings in a particular encoding, often UTF-16. In turn they need to be told or try to detect the encoding of everything that has to do with text. They need to know what encoding the source code is saved in, what encoding a file they're supposed to read is in, what encoding you want to output text in; and they convert encodings on the fly as needed with some manifestation of Unicode as the middleman. They're doing the same thing you can/should/need to do in PHP semi-automatically behind the scenes. That's neither better nor worse than PHP, just different. The nice thing about it is that standard language functions that deal with strings Just Work™, while in PHP one needs to spare some attention to whether a string may contain multi-byte characters or not and choose string manipulation functions accordingly. Since Unicode deals with many different scripts and many different problems, it has a lot of depth to it. For example, the Unicode standard contains information for such problems as CJK ideograph unification. That means, information that two or more Chinese/Japanese/Korean characters actually represent the same character in slightly different writing methods. Or rules about converting from lower case to upper case, vice-versa and round-trip, which is not always as straight forward in all scripts as it is in most Western European Latin-derived scripts. Some characters can also be represented using different code points. The letter "ö" for example can be represented using the code point U+00F6 ("LATIN SMALL LETTER O WITH DIAERESIS") or as the two code points U+006F ("LATIN SMALL LETTER O") and U+0308 ("COMBINING DIAERESIS"), that is the letter "o" combined with "¨". In UTF-8 that's either the double-byte sequence 11000011 10110110 or the three-byte sequence 01101111 11001100 10001000, both representing the same human readable character. As such, there are rules governing Normalization within the Unicode standard, i.e. how either of these forms can be converted into the other. This and a lot more is outside the scope of this article, but one should be aware of it. Text is always a sequence of bits which needs to be translated into human readable text using lookup tables. If the wrong lookup table is used, the wrong character is used. You're never actually directly dealing with "characters" or "text", you're always dealing with bits as seen through several layers of abstractions. Incorrect results are a sign of one of the abstraction layers failing. If two systems are talking to each other, they always need to specify what encoding they want to talk to each other in. The simplest example of this is this website telling your browser that it's encoded in UTF-8. In this day and age, the standard encoding is UTF-8 since it can encode virtually any character of interest, is backwards compatible with the de-facto baseline ASCII and is relatively space efficient for the majority of use cases nonetheless. Other encodings still occasionally have their uses, but you should have a concrete reason for wanting to deal with the headaches associated with character sets that can only encode a subset of Unicode. The days of one byte = one character are over and both programmers and programs need to catch up on this. Now you should really have no excuse anymore the next time you garble some text. What Every Programmer Absolutely, Positively Needs to Know About Encodings and Character Sets to Work With Text by David C. Zentgraf is licensed under a Creative Commons Attribution-NonCommercial-ShareAlike 3.0 Unported License. Last updated on Monday, April 27th, 2015.